Green Enchiladas with Beef – Mexican Delight! 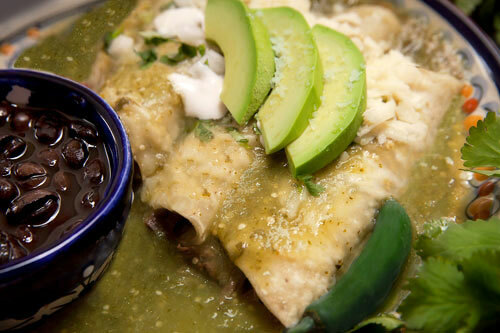 The enchiladas are a very popular dish in the Mexican cuisine. In fact by mixing several and diverse ingredients numerous varieties of the same dish can be obtained. When a Mexican chef is going to prepare some enchiladas, he knows that first various ingredients have to be transformed into a salsa. Then he makes some kind of beef tacos , which are covered with the salsa that was prepared and at the end the enchiladas are garnished by putting various fresh ingredients over them. We are sure that you want to try them! – In Mexico the enchiladas are served as main course and they can be served plain or with red or white rice and refried beans. In this recipe there are many steps to follow and it can be a bit complicated. However everything is divided into stages to make it easier. The enchiladas are filled with the “skirt steak" cut because it is a beef that is very easy to shred, once cooked. To make the enchiladas tortillas are going to be fried. We recommend using a vegetable oil and not olive because it resists very high temperatures without burning. Furthermore it doesn’t add any flavor to the food that is being fried. The preparation time is long of 1 hour 15 minutes , since the skirt steak takes long to cook. This recipe serves 10 enchiladas. Take from the saucepan the beef with the kitchen spoon, wait until it cools a little and shred it; then set aside. Put on a large plate the fried tortilla with salsa and put over the tortilla some of the skirt steak that was shredded. Variations: You can also prepare the enchiladas with ground beef or with chicken or even with cottage cheese. Did you like the Beef Enchiladas? Here is the Skirt Steak that you need to make the enchiladas. The beauty of this skirt steak is that it is 100% organic, it is soft, it has a lot of flavor and it will arrive fresh to your house.